The reality started to sink in for Anna Dixon and Carson Buffington. The Louisburg seniors walked onto the court for their final home regular season contest and memories started to rush back. Their time as Lady Cats are coming to a close. Both players, along with manager Bailey Kern, were honored during their Senior Night ceremony prior to Tuesday’s home dual with Piper. The same could be said for Buffington. Emotions were all over the place Tuesday as there was a little bit of sadness, but there was also plenty to be excited about as Louisburg entered the dual undefeated in league play. The Lady Cats already clinched the Frontier League crown, and this match was only a formality. Louisburg had no problem with Piper and rolled to a 25-9, 25-5 and 25-9 victory over the Pirates to finish with a perfect league record and moved its overall record to 30-8 on the season. It was the first league title for Louisburg since 2015. Senior Carson Buffington gets a hug from Reilly Ratliff-Becher, while Carson’s mother, Amy, shares a hug with Erin Lemke. 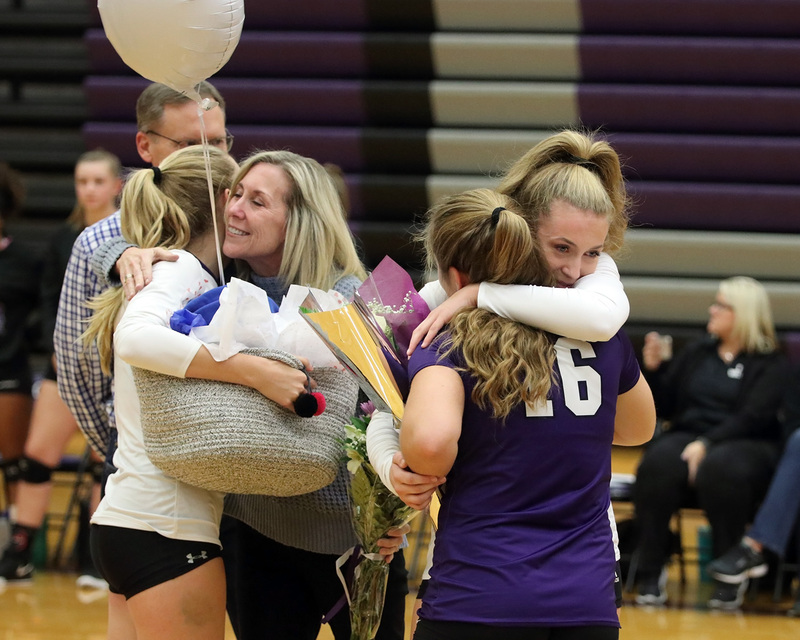 Winning a league crown was the perfect way to honor both Dixon and Buffington, according to Louisburg coach Jessica Compliment. The dual itself provided little drama and gave the Lady Cats opportunity to play loose. 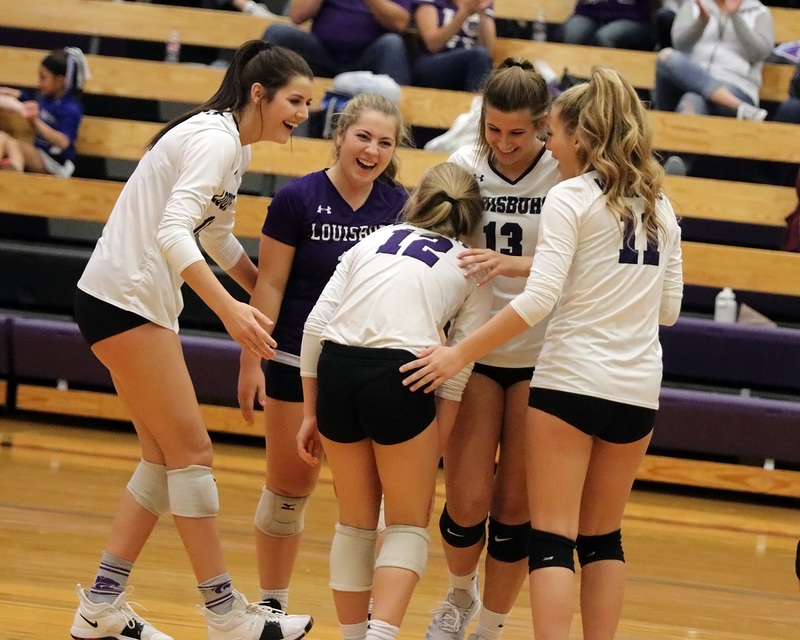 Louisburg got contributions from up and down its lineup, and it even allowed bench players Sydni Keagle, Alyse Moore and Chase Kallevig to see action in the final set. Dixon led the Lady Cats offensively with seven kills, while Buffington was right behind her with six. Juniors Haley Cain and Erin Lemke both had three kills as well. Louisburg had 10 aces on the night, including four from freshman Davis Guetterman and a pair from Cain and Riley Kallevig. Sophomore Carleigh Pritchard, who normally doesn’t serve during a match, got an opportunity to close out the second set and she did just that by serving the final six points to seal the win and recorded two aces in the process. Freshman setter Rinny McMullen finished the night with 14 assists and Guetterman added six in the win. Defensively, Dixon led the way with six digs, while junior libero Reilly Ratliff-Becher finished with five. (From left) Anna Dixon, Reilly Ratliff-Becher, Rinny McMullen, Alyse Moore and Carson Buffington were all smiles following a point late in Tuesday’s dual with Piper. Louisburg will have one final opportunity to play at home Saturday when it hosts a Class 4A sub-state tournament as the No. 4 seed. The Lady Cats will face No. 13 Iola (10-17) at 2 p.m., and if they advance, will meet the winner No. 5 Eudora (22-11) and No. 12 Fort Scott (11-23) at 4 p.m., in the championship match. A win there would give the Lady Cats another trip to the state tournament, after they finished second a year ago. The two Louisburg seniors are also looking forward to one more opportunity to play on their home floor.